The “Amazon Effect”? How about the “Trump Effect”? Manufacturing looks strong, but what’s that threat on the horizon? Let’s see. Shares of Amazon are down 6.8% in less than three trading days. But to hear the mainstream tell it, everyone’s overreacting. “Don’t Trade the Tweets: Why Amazon Investors Can Ignore Trump’s ‘Concerns’” — MarketWatch. As we mentioned at the time, this all started on Wednesday when the political website Axios reported the president is “obsessed” with AMZN and is looking for some way to leverage the power of the federal government to knock down the company a peg or two. 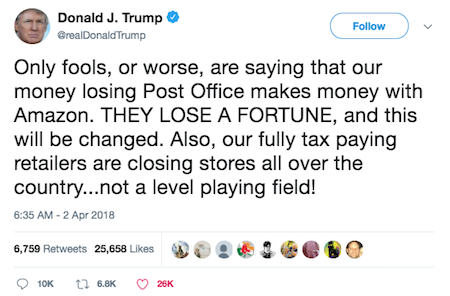 No, we’re not going to dig into the weeds of whether the Postal Service makes or loses money off Amazon. But we will point out something we mentioned last year as the “retail apocalypse” was making headlines: Relative to the rest of the world, the United States is choking on square footage devoted to retail. By one estimate, America has three times the retail space of any other developed country. America has roughly 50 square feet of retail space for every man, woman and child. In Europe, it’s more like 10 square feet per capita. So it’s not all about Amazon. If you read beyond the headlines, however, you can see that Trump’s threat to Amazon is way more than words. Mere rumors of such action last summer delivered Jim’s readers a quick 32% gain. This time, he says the profit potential is much greater — as much as 400%. Dive right into his Penny Pot Profits portfolio here. On the topic of Trump and Amazon and overindebted real estate developers, a reader writes: “A similar thought crossed my mind after President Trump signed his $1.3 trillion spending boondoggle into law. “He still has to maintain his real estate empire in Democrat-controlled cities and maybe this was his way of greasing the wheels of democracy. You know someday he has to return to his original job and you know well that he would never sacrifice it save to the country! That part about men with sacred honor, valor and sacrificing life and limb for freedom hasn’t existed in this country for a couple hundred years. Men like that certainly don’t exist in the swamp today. “As you correctly point out, Venezuela won’t be the last country to introduce a national cryptocurrency,” begins today’s mailbag. “Who’s next? “IMO it doesn’t matter — because nothing that happens in a socialist country can work. Before Venezuela became a dumpster fire, it was a poster child for progressives here in America. Now that it has descended into anarchy and mayhem, they don’t seem to mention it so much but they still keep touting the virtues of ‘Nordic social democracy’ (as if that’s better). “Those would be the utopias that are on the same path but have not yet arrived at the deadly endgame. America is also on this path. “When totalitarians are in charge, the many always suffer and die for the benefit of the few. That’s how the socialized version of ‘equality’ works. It ain’t complicated. “If Venezuela’s crypto actually takes off and is successful, bumping international monetary contr-… er, um, supervision out of the picture… how long before Venezuela becomes a ‘terrorist nation and threat to global security’? The 5: Hmmm… The likelihood of success seems mighty slim. But yes, that’s surely the script the power elite will follow. P.S. As the day wears on, the sell-off has accelerated — especially in Amazon. And the mainstream headlines are changing their tune: “Amazon Slumps After Another Round of Trump Rants,” says Bloomberg. Of course, tweets are cheap — action is what matters. And Jim Rickards says action is coming sooner than almost anyone on Wall Street expects. When it does, a select few people will exploit the resulting volatility for gains of up to 400%. It’s a fast-moving story: Jim urges you to check it out for yourself while there’s still time.